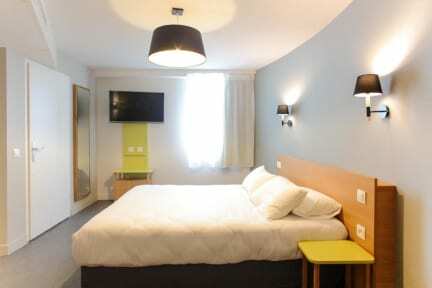 Hotel Reseda i Paris, Frankrike : Boka nu! The hotel has 164 rooms (including 4 rooms for disabled guests). Our hotel offers several room types to meet your requirements. All are equipped with bathroom with shower, a work area, direct dial telephone, TV with Canal + and satellite channels and air conditioning. 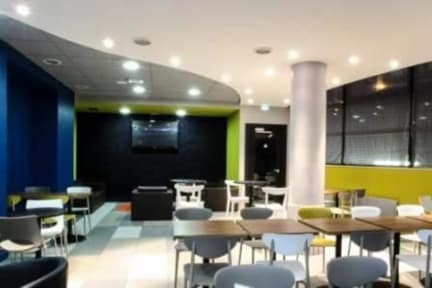 The hotel is located 50 meters from the Metro Gallieni (line 3), 20 minutes from the international airport Charles de Gaulle and directly connected by bus 351. The hotel is located 35 minutes from Disneyland and 20 minutes from Villepinte Exhibition Park and the Parc Astérix. The Classic rooms are our first price, comfortable, with twin beds, can accommodate one or two people. All are equipped with bathroom with shower, sink and toilet, a television, a desk and a wardrobe. Even at a low price will be your sleep quality! Comfort rooms are composed of a large bed (160) or two small beds. They are all equipped with bathroom with shower, a working telephone, television with Canal + and satellite channels, a storage space. You will find serenity alone or together in our comfortable hotel rooms.